Seawise Giant - Seawise Giant is the biggest ship of the world ever built till present.Seawise Giant, later Happy Giant, Jahre Viking, and Knock Nevis, was a ULCC supertanker and the longest ship ever built, and possessed the greatest deadweight tonnage ever recorded.Fully laden, her displacement was 657,019 tonnes (646,642 long tons; 724,239 short tons), the heaviest ship of any kind, and with a draft of 24.6 m (81 ft), she was incapable of navigating the English Channel, the Suez Canal or the Panama Canal. Overall, she was generally considered the largest ship ever built,as well as the largest self-propelled manmade object ever built.Seawise Giant was built-in 1979 by Sumitomo Heavy Industries, Ltd. at their Oppama shipyard in Yokosuka, Kanagawa, Japan as a 418,000 ton ULCC to be named the Porthos by a Greek owner. It was last used as a floating storage and offloading unit (FSO) moored off the coast of Qatar in the Persian Gulf at the Al Shaheen Oil Field.The vessel was sold to Indian ship breakers, and renamed Mont for her final journey in December 2009. After clearing Indian customs, she was sailed to, and intentionally beached at Alang, Gujarat, India for demolition. Along with the title of being the biggest ship of the world, the Seawise Giant also holds the title of being the biggest Oil tanker type ship ever built.With the deadweight tonnage almost a massive 564,700 tones and a surprisingly top speed of 16 knots, Seawise Giant has faithfully served the world and fared the seas for an astounding 30 years till 2009. Seawise Giant was also called the Queen of oceans and rivers. 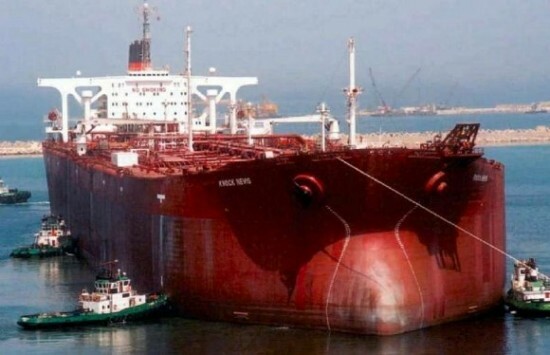 The length of Seawise Giant is 1,504 feet which makes it the biggest ship of the world.